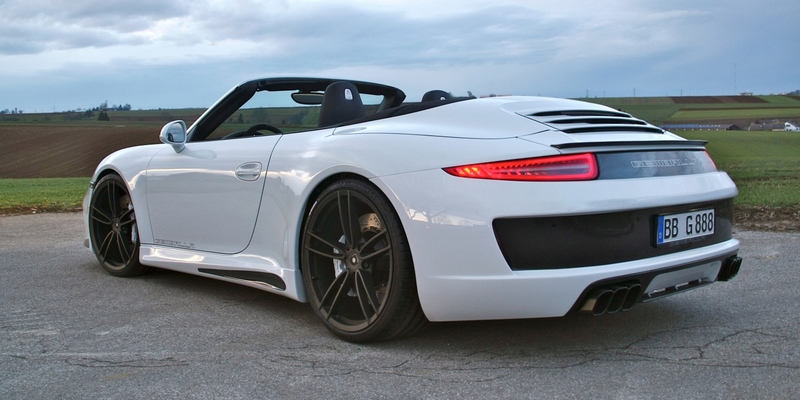 The Porsche 991 Carrera S Convertible combines speed and style with an enthralling al fresco driving experience. Now Gemballa puts the icing on the cake with their new GT aerodynamic and technology package. The face of the Gemballa GT aerodynamic package is the strongly contoured front bumper, whose three large cooling air intakes and carbon-fibre spoiler lip give the car its more aggressive visage. Along its flanks, the curvaceous lines of the 991 Carrera S Cabriolet are further emphasized by the more heavily contoured side skirts that lead your eyes to the re-imagined rear. Here, the dark painted recess in the bumper, carbon-fibre strip between the lights, diffuser with cutouts for the exhaust pipes, and the Gurney lip spoiler make the car appear even lower and wider. All these Gemballa components are made from carbon-fibre, either natural look or painted body colour, and apart from the Gurney lip spoiler, are attached using the factory mounting points. The aerodynamic package starts at 19,860 EUR (in Germany with VAT) including painting and fitting. The dual triple-tail pipe exhaust system with throttle activated sound control takes a leaf from Gemballa’s own history book. This is the 21st Century interpretation of the six-pipe exhaust first seen on the Gemballa Avalanche, a seminal 1980s poster child. Apart from its deeper, more purposeful voice, this exhaust system’s lower backpressure is worth up to 10hp extra. Shorter, uprated sport springs that work with the factory PASM active damping system, drop the ride height by 20mm. In combination with the Gemballa-21-inch GForged-one wheels, they give the car its more purposeful stance. Available in "black magic" or "gunmetal" with or without a glossy turned "diamond cut" finish, these ultra-light forged alloys weigh less than the equivalent factory 20-inch wheels, benefiting unsprung weight and handling. Prices start at 8,948 EUR incl. VAT for a set of four in Germany, depending on the wheel/tyre combination. Another unique Gemballa offering is the high performance brake system developed in conjunction with Brembo. Apart from providing shorter stopping distances, this system is virtually fade free. When open to the sky, a convertible perfectly highlights the custom interiors that are a traditional Gemballa specialty. Clients can have their very own bespoke interior designed and handcrafted as with haute couture tailoring. In this case, the palette of materials and colours available range from the finest hides and Alcantara with trim fabricated from complementary colours of high quality wood, carbon-fibre or aluminium. Literally every detail right down to wafer thin leather covering individual switches or air vents can be finished according to a customer’s wishes. On a more technical level, the latest multi-media equipment can be installed, delivering state-of-the-art in-car entertainment to supplement the bewitching tunes played by the flat-six motor.